ROANOKE, Va. (May 30, 2016) ­– More racers brought more money to the Roanoke Region’s economy during the eighth annual Foot Levelers Blue Ridge Marathon, double marathon, half marathon, relay, Carilion Family 1-Miler, and Anthem Star 10K. 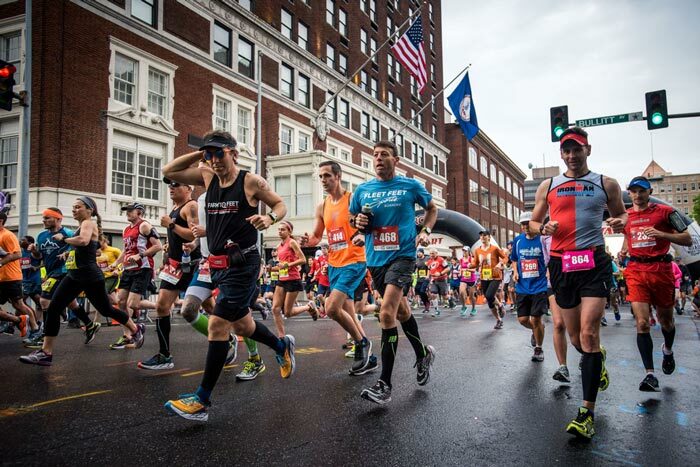 “America’s Toughest Road Marathon” hosted 1,859 runners who generated more than $613,000 in economic impact according to an analysis by the Roanoke Regional Partnership and Roanoke Valley-Alleghany Regional Commission. Over the past eight years, the event has contributed more than $3.8 million to the local economy. A post-race survey determined the April 16 races created $349,005 in direct new sales activity, plus an additional $264,543 in indirect and induced spending for a total of $613,548 – up 3.6 percent over 2016. Activity surrounding the event will also support 6.9 jobs in the regional economy over the period of one year. The economic impact is larger this year as a result of increased number of participants from outside the Roanoke Region. The number of runners participating from outside the region accounted for 54 percent of race participants. The race drew runners from 43 states – in addition to the District of Columbia – and eight countries: Albania, Canada, Ireland, Italy, Moldova, Mongolia, South Africa, and the United Kingdom. The Roanoke Regional Partnership and Roanoke Valley-Alleghany Regional Commission prepared a participant survey to measure the event’s economic impact. Respondents were asked to report the amount spent on fuel, meals, lodging, miscellaneous retail purchases, and admissions while in Roanoke. Approximately 48 percent of participants participated in the survey. More than 44 percent of all survey respondents reported staying in town for at least one night. Approximately 38 percent stayed between one and two nights. The average length of stay among overnight visitors was 1.7 nights. About 46 percent of respondents reported traveling with family or friends, with an average of 1.1 additional people in the travel party among overnight visitors. Day-trip visitors traveled with an average of 0.4 others. The race started in downtown Roanoke and climbed to the top of Mill Mountain and Roanoke Mountain along sections of the Blue Ridge Parkway for a total elevation change of 7,430 feet, making it America’s Toughest Road Marathon. Along with national interest in the race, local participation continues to grow. The Anthem 10K race option, Carilion Family 1-Miler, post-race festival and concert in conjunction with the Down by Downtown Music Festival, brought the community out to Elmwood Park. The 2018 races are scheduled for April 21, and 2018 registration will open June 1st.